Join us! For more information, contact us via email at LSUllum@aol.com. 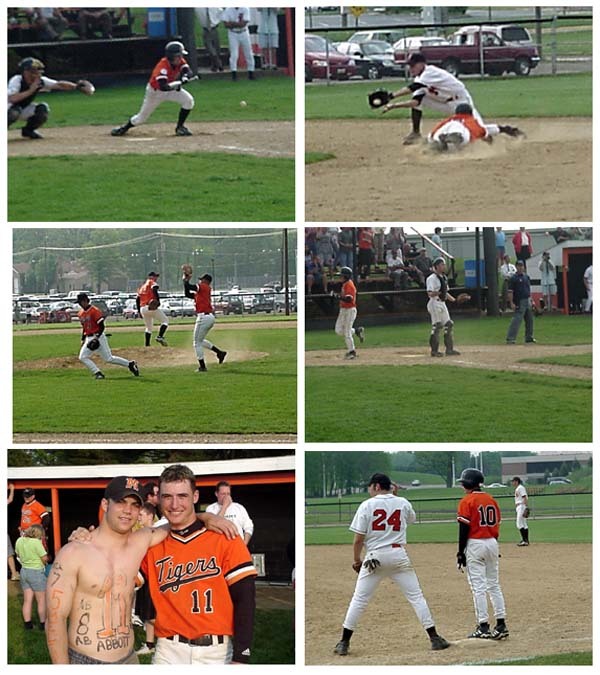 The Massillon Tiger baseball team opened the 2000 season in resounding fashion by downing the Green Bulldogs 8-2. The story of the game was starting pitcher B.J. Budd who went 6-1/3 innings and surrendered only a single hit. Budd retired the first 13 batters he faced before giving up a meaningless walk in the sixth. In a bid for a complete game no-hitter, Coach Tim Ridgley elected to leave Budd in the game to start the seventh. He struck out the first batter he faced and walked the next, but then Jeremy Jacobs went deep allowing the Green to score their only runs of the game. Budd was then replaced by Chris Swenson, who pitched the remainder of the inning. Budd pitched spectacularly, striking out twelve and walking only two. His fast ball was overpowering and his change of speed pitches caught the Bulldog hitters often swinging early. If Budd continues to pitch this way, he is in for an outstanding season. On the offensive side, Massillon struck for five runs in the fourth inning to open up an insurmountable 6-0 lead. Chad Marceric hit a triple and a double and Jason Savage added a pair of singles plus his second and third runs of the game. The Tigers almost had it put away in the fifth with the bases loaded and leading 7-0, but Green managed to get a ground out to escape. In the second game of the double header, starting pitcher Jason Savage gave up six runs in the first inning and it was too much for the Tigers to overcome. Although battling back throughout the rest of the game, they eventually fell 7-6. Massillon's record is 1-1 and Green is now 2-1. 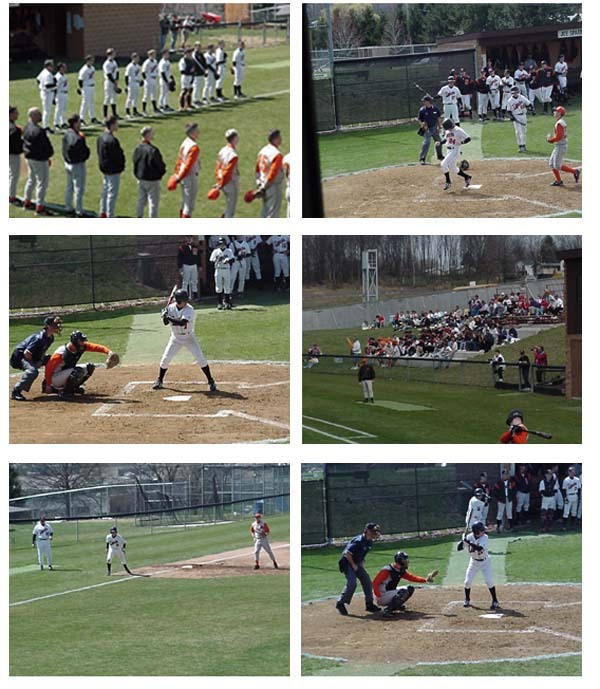 Photos: (1) Massillon and Green prepare to battle, (2) Jason Savage scores the first run of the year, (3) Dan Ackerman at bat, (4) part of the large crowd in attendance, (5) Chad Marceric on third, and (6) Ryan Ridgley at bat. Photos: (1) winning pitcher B.J. Budd, (2) Jason Abbott rounding third and headed for home, (3) Jason Savage at bat, (4) the bleacher bums, (5) Savage and Chad Marceric, and (6) Ryan Ridgley digging for third. The rain has moved out and it's time to return to the diamonds. What better way to spend a spring afternoon than at the ballpark watching the Tigers. Defense ruled the day as both the boys' baseball and the girls' softball teams were involved in pitching duals, with both games ending up 1-0. B.J. Budd turned in another pitching gem at Ducky Shroeder field, this time the defending Division II state champs scoreless. Meanwhile, sophomore designated hitter Dan Melito singled in Anthony Battle for the only run of the game. Budd was in command from the start, racking up eleven strikeouts and walking only three. Walsh never mounted a serious threat until the last inning when the leadoff batter singled and a ground out moved him to second and into scoring position. But there were two outs and B.J. simply fanned the last batter to record his second win in two starts. When asked if he was tiring in the seventh inning, B.J. said, "I just block it out and try to get the guy at the plate." He also credited his pitching coach for helping him pick the right pitches and his teammates for getting the clutch run. That run came in the fourth inning to break a scoreless tie. Anthony Battle singled to left, stole second and then moved to third on a wild pitch. That set up Melito's game-winning single. From then on, the momentum stayed in Massillon's favor. With the win Massillon improves its record to 2-1. Walsh, in spite of using their top pitcher (Alaburda), suffered its first loss of the season and falls to 3-1. Tomorrow these two teams will rematch at Walsh. Photos: (1) bunt attempt, (2) starting pitcher B.J. Budd, (3) Dan Melito at bat, (4) Anthony Battle is safe at second, (5) game-winning run, (6) two on in the sixth, (7) catcher Charles Hendricks behind the plate, and (8) game end. Massillon opened up an early 3-0 lead against homestanding North Canton Hoover, but couldn't hang onto the lead, eventually falling 4-3. It didn't help that the Tigers stranded ten runners. 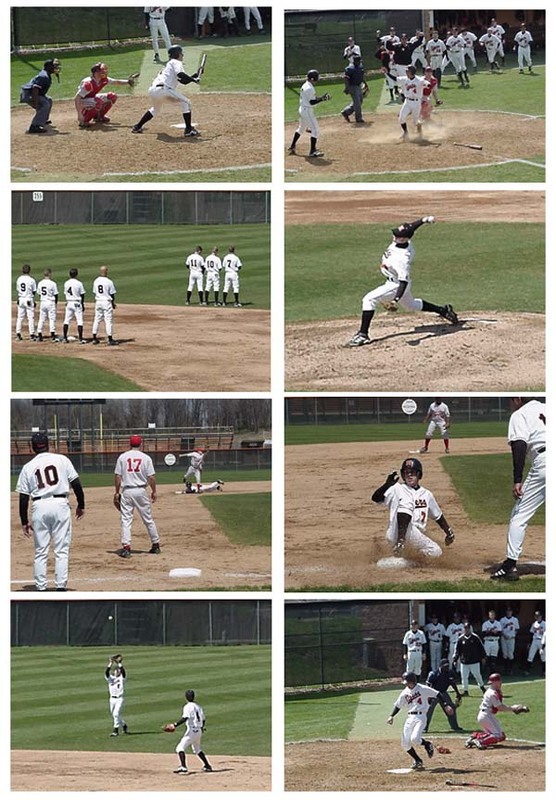 In fact, Massillon had players on base in every inning except the sixth. Junior Jason Savage started on the mound and gave up a single run in the second inning until disaster struck in the fourth. He would record only one out in the inning as Hoover scored three times aided by several walks. Chris Swenson came on in relief to finish the inning and David Broome pitched the rest of the way. According to Head Coach Tim Ridgley, Broome did a fine job, holding North Canton hitless and striking out two. Swenson also pitched well. Massillon had a chance to tie the game in the seventh with a man on first and only one out, but couldn't bring him around. "We played good defensively, but we didn't hit the ball at the right time," said Ridgley. "North Canton got the hits when they needed them." Massillon is now 2-2. Chad Marceric led the Tigers batting 2 for 4 and scoring a run. Also scoring were Dan Ackerman and Dan Melito. The baseball team will be in action on Wednesday at Lake and home to Central Catholic on Thursday. The Central game is a recent addition to the schedule. A disappointed Coach Tim Ridgley looked forward to better days after being humbled by neighboring Central Catholic. The Crusaders were in control all the way and sealed the win with one big inning, but the Tigers never quit and tried to make a game of it toward the end. Central opened up an early 4-2 margin and maintained the lead throughout the game enroute to a 9-6 victory. Central improves its mark to 5-2 while the Tigers fall to 2-3. Coach Ridgley term the game "ugly" and indeed it was as Massillon played perhaps its worst game of the season. The coach was at a loss for words but emphasized that if the team continues to play the way they have in the last two games, the wins will be few. At the top of the fifth inning, with the bases loaded, Central advanced the runner on third to improve their lead to 5-2. But starting pitcher David Broome struck out the next batter to get out of the jam. He wasn't so fortunate in the sixth as his control problem continued to deteriorate, loading up the bases again, this time with no outs. 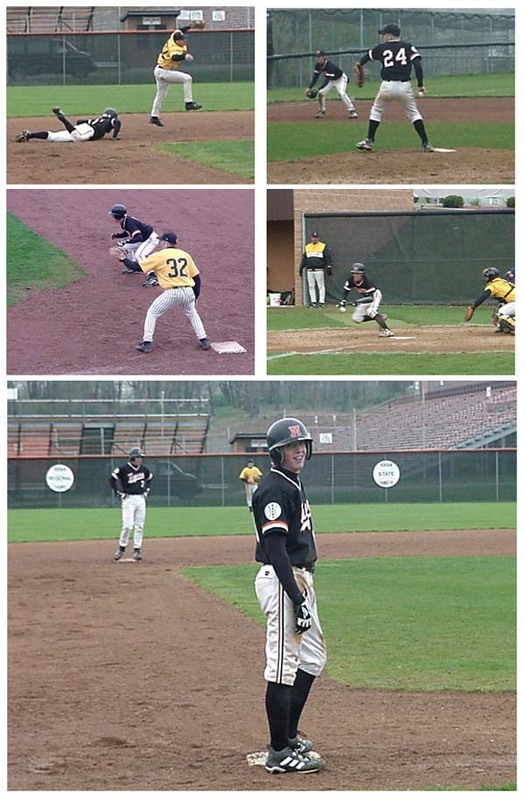 Following an assortment of hits and walks and two pitching changes by the orange and black, the Crusaders managed to plate four additional runs. The inning ended with the Tigers down 9-2. Massillon attempted a comeback in the bottom half of the sixth by loading the bases with no one out, but could only score once. 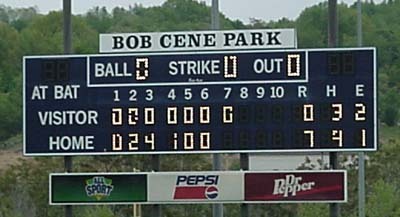 They did, however, manage to get some action started in the last inning scoring by three runs, but only to make the final score somewhat respectable. Leadoff batter Ryan Ridgley struck out and stole first off a passed ball. Then Dan Ackerman crushed a fly ball over the centerfielder's head and the Tigers had runners at second and third. A base hit by Todd Helline scored Ridgley. Jason Savage grounded out to score Ackerman and Anthony Battle grounded out to score Helline. But a called third strike against Chad Marceric and a flyout by Charles Hendricks closed the inning. This team is loaded with talent and one can only hope that they break out of this slump soon. Soon better be on Friday as they travel to Lake to face the best pitcher in the county, Lorenzo. Fortunately, Massillon will counter with their ace B.J. Budd, who is 2-0 on the season.. 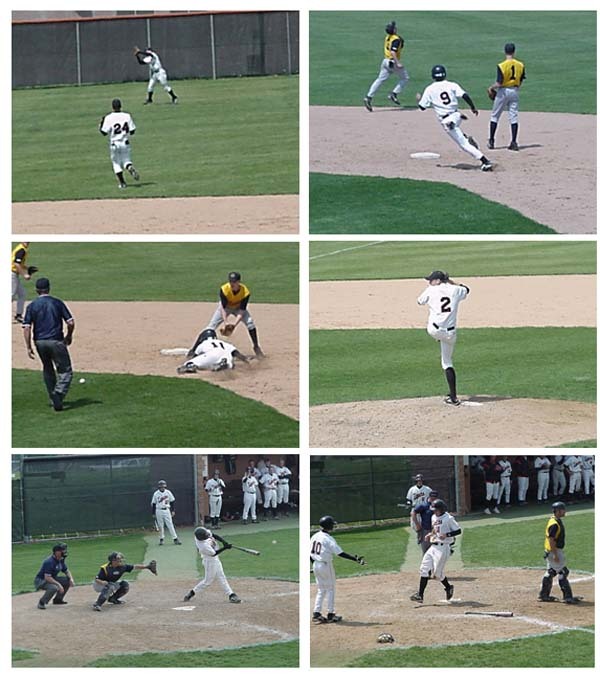 Photos: (1) two runners in position to score, (2) Dan Ackerman at the plate, (3) the between inning job, (4) starting pitcher David Broome, (5) the infield is in to cut off the run, (6) Coach Ridgley and Anthony Battle confer, (7) Todd Helline scores, and (8) Jason Savage scoops up the ground ball. 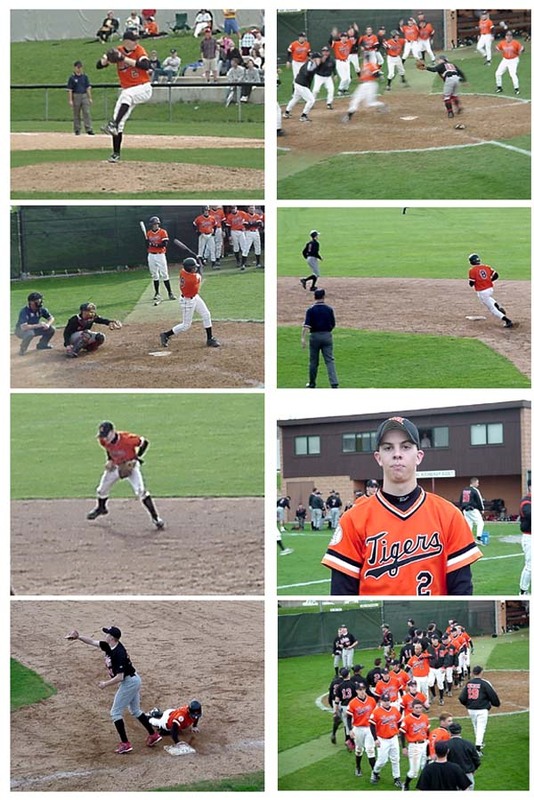 The Massillon Tiger baseball squad dropped Lake from the ranks of the unbeatens on Friday by the final score of 6-5. On the road for the second time this year, Massillon used a big inning to make the difference but the finish wasn't without its dramatic moments. .Starting pitcher B.J. Budd came through again, holding Lake to just two runs through six innings of play. He also walked four and struck out seven. He has now struck out 30 batters in three appearances. Cleanup duties went to Chris Swenson and Jason Abbott. After a scoreless first inning the Massillon bats literally came alive, something everyone's been waiting for the past two weeks. Five runs were scored on six hits as everyone got into the action. With a sixth run in the fifth, it was enough. The drama unfolded in the bottom of the seventh, when Lake scored three runs and had the bases loaded with two outs. Faced with the winning run on second base, Abbott proceeded to strike out the last batter but not before he fouled off seven consecutive pitches sitting on a full count. Sophomore Danny Melito had an outstanding game smacking three doubles in four trips to the plate. Jason Savage was two for four and Jason Abbott was one for three but with two RBIs. Also, Charles Hendricks scored a pair of runs. Massillon evens its record at 3-3 while Lake falls to 4-1. On Saturday the Tigers entertain a very good Dover ball club at home. Dover sports an 8-1 record, their only loss coming to undefeated North Canton, who also beat the locals 4-3. 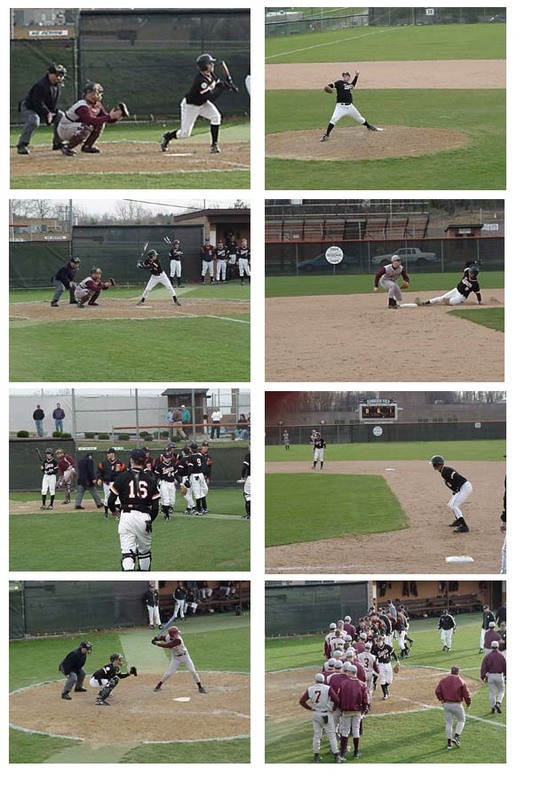 The bats came alive on Saturday as the Massillon baseball team pounded out 26 hits to sweep a Saturday doubleheader. The victim was Dover who entered the game with an 8-1 record. The Tigers now appear to be over the early-season slump and back on the track predicted for this year. Anthony Battle swung the hot stick batting 4 for 5 and scoring four runs. "Anthony's been struggling lately," said Coach Tim Ridgley. "He's really been working hard to keep his head on the ball. When he works hard good things happen." Todd Helline also had a big game at 3 for 4, crossing home plate three times. Adding to the fray was Chad Marceric who hit two fly balls to the wall for standup doubles. Massillon had to come from behind in the bottom of the seventh to win this one and it ended in dramatic fashion. The inning had several heroes but Anthony Battle came up with the hit, knocking in Todd Helline who score the winning run. Trailing 7-5, leadoff batter Charles Hendricks hit a short fly ball that landed on the right field line for a single. This was followed by line drives to center field by Dan Ackerman and Todd Helline, scoring Hendricks. A sacrifice bunt by B.J. Budd moved the tieing run to third and the winning run to second. In a strategy move Dover intentionally walked power hitter Chad Marceric which loaded the bases and sent Battle to the plate. Anthony faced the Tornado pitcher down and sent a screaming line drive over second base and into the outfield to end the game. It was a heart-stopping finish to a hard fought game by both teams. Dover tallied their seven runs off of starter Jason Savage who pitched the first four innings. Savage was pretty well beat up after his outing surrendering eight hits and two walks. He did, however, manage to strike out four. Josh Strubel pitched the last three innings and held Dover scoreless, striking out three. Meanwhile, Massillon scored four runs in the second inning and another in the third to keep it close. Five Tigers reached base in the second including Ryan Ridgley, Helline, Budd, Marceric, and Battle. In the second game, the Tigers scored all the runs they needed in the first two innings and coasted to the win. Helline walked to start the game followed by Savage who hit a double. Consecutive hits by Hendricks and Dan Melito brought the two runners around. Budd reached base on an error scoring a third run and Ryan Ridgley singled in two more to put home team on top 5-0. Marceric and Battle each scored in the second and Budd and Ackerman added insurance in the sixth. Three players had two hits each including Savage, Marceric, and Ridgley. Massillon's record is now 5-3 while Dover falls to 8-3. Next up for the Tigers is their nemesis, the Canton McKinley Bulldogs. On Tuesday the team will travel to Canton and then on Thursday play host to the Pups. In the past three games Massillon has played a couple of outstanding teams with a combined 12-1 record. But the Tigers showed they can too be a formidable opponent. All they did was win all three games, score 23 runs and pound out 35 hits. "I knew we had the talent but we've been up and down," said Ridgley "We hit the ball well today and took a lot of pressure off the pitchers. When you do that you get a lot of wins." Caption: (1) B.J. 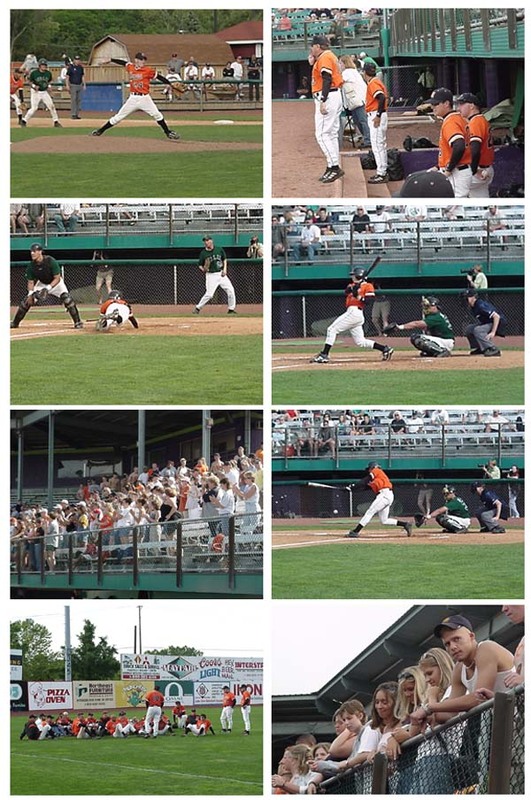 Budd lays down a sacrifice bunt, (2) Todd Helline scores the winning run, (3) National Anthem, (4) pitcher Jason Savage, (5) safe at second, (6) Dan Ackerman slides into third, (7) Dan Melito makes a putout, and (8) Todd Helline scores in the second inning. 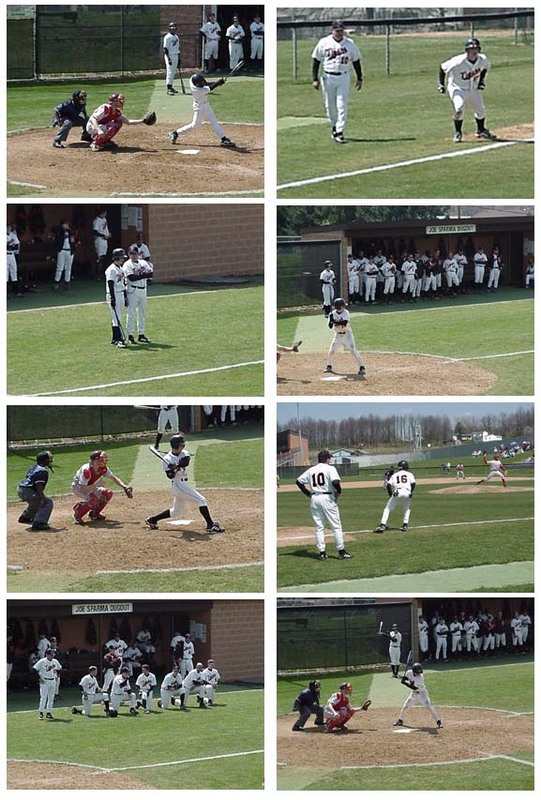 Caption: (1) Chad Marceric at the plate, (2) runner on third, (3) Coach Ridgley confers with the batter, (4) Drew Feucht at bat, (5) Jason Abbott follows through, (6) Drew Feucht on third, (7) awaiting the seventh, and (8) Drew Feucht at bat. It was like winning the big football game by throwing a bomb for a touchdown as the clock runs out. That's what it must have felt like to Jason Abbott too as he crushed a fly ball down the right field line to knock in two runs and down Canton McKinley 5-4. Down to their last out of the ballgame and with runners at first and third, Abbott took a 2-1 pitch and flew it down the line. Dan Melito, the runner on first, was off on the hit. Would it stay fair? Yes. Down the line it went, out of reach of the right fielder, a hit for sure. The ball heads for the fence. Charles Hendricks scores easily to tie the game. Melito rounds second and heads for third. The right-fielder fires to the relay. The base coach waives Melito home. The dugout empties in anticipation. Here's the throw to the plate and Melito is safe. The Tigers win. Pandemonium. "You can't say enough after taking him out in the fifth for a pinch hitter," said Coach Tim Ridgley. "That's twice he's won games for us. The other one was at Lake. That says a lot about him." McKinley scored two runs in the first inning and built it to a 3-1 margin at the end of the third. By that time starting pitcher B.J. Budd had left the game after being hit by a line drive in his thumb. Replacing Budd was Chris Swenson who did a marvelous job making only one mistake, a home run in the sixth. "He did a real nice job," said Ridgley. The Tigers battled back to tie the game in the fifth just before the long ball. Then with two outs and a runner on second, the next Bulldog batter hit a liner to centerfield. Ryan Ridgley fell as he was gathering in the ball, then got up and made a perfect throw to Anthony Battle who was positioned on the pitcher's mound for the cutoff. Battle turned and fired a strike to the catcher, Hendricks, who applied a bone-crushing tag on the runner to end the inning. That left Massillon only one run back setting up the dramatic seventh inning finish. "Our batters struggled with the slow McKinley pitcher," said Ridgley. "I didn't think we hit the ball hard except for a few." Those few were Hendricks (3 for 3), Battle (3 for 4), Todd Helline (2 for 4), and Chad Marceric (2 for 4). These guys accounted for 10 of the Tigers' 13 hits. "We haven't played for five games," concluded Ridgley. "I'm must happy we're out of here with a win." And it's nice to beat the Bulldogs, regardless of the sport. 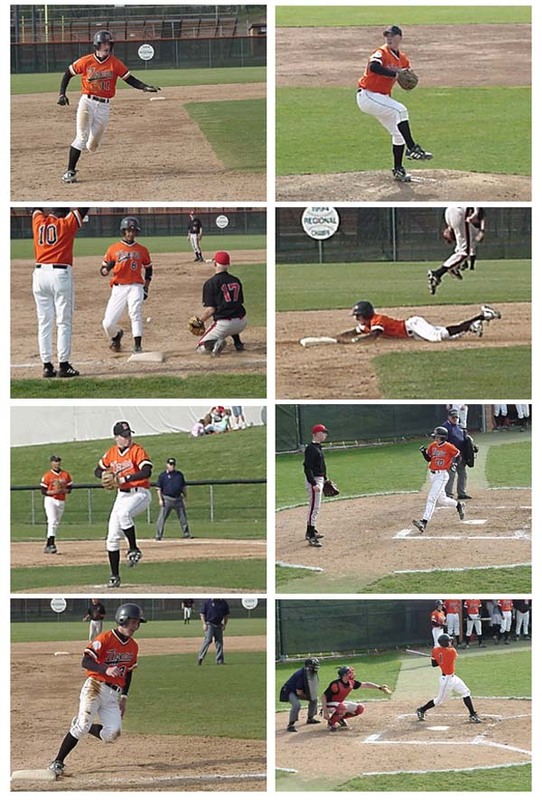 Caption: 1) Chris Swenson prepares to mow 'em down, 2) in a blur, Dan Melito scores the winning run, 3) Anthony Battle raps another single, 4) Battle rounds second, 5) Jason Savage does it the hard way, 6) Swenson, the winning pitcher, 7) Dan Melito slides into first, and 8) congrats to the victors. Once again the Massillon baseball team snapped up a victory in the bottom of the last inning, this time downing 1999 state runnerup Cuyahoga Falls 7-6. With two outs in the bottom of the eighth, Todd Helline smashed a single to right field and then was batted in by B.J. Budd who followed suit. The Tigers are making a habit of this script, having done the same against both Dover and Canton McKinley during the past week. But they'll take this win, and the next one too as they captured the second game of the twinbill, 2-0. After six innings of play Massillon held a slim 6-5 lead. That's when the Falls' batters went to work. After scoring the tieing run and loading the bases with no one out, it looked like Falls was in position to build an insurmountable lead. That's when pitcher Jim Barkan scooped up a slow roller and tossed the ball to the catcher, Charles Hendricks, for the force at home. The next Black Tigers' batter hit a long fly ball to right fielder Dan Ackerman. Ackerman immediately threw a one-hopper to Anthony Battle who relayed the throw to Hendricks for a one-handed tagout. It was a tremendous play allowing the local Tigers to escape disaster. Massillon scored two runs in the first inning when Battle doubled in Jason Savage and Chad Marceric. In the third inning the Tigers batted around, aided by three bases on balls. Runs were scored by Dan Ackerman, Marceric and Battle. Marceric also held the hot stick in this game batting 2 for 3 and scoring three times. The winning pitcher in game two was Jason Savage, who scattered three hits during six innings of work and helped the orange and black to a 2-0 advantage. He also struck out nine batters. Savage had struggled in his previous outings this year, but looked exceptional in this one and seemed to get stronger as the game progressed. Using a variety of breaking balls and spotted fast balls, he kept the hitters off stride during the whole game. In the second inning Ryan Ridgley batted in Battle and in the fourth Dan Ackerman smacked a double to score Jason Abbott. The game was close but the Tigers seemed to be in control all the way. Battle led the hitters with a 2 for 3 effort including a run. Jason Abbot pitched the seventh inning and got the save but not without some drama. After hitting two batters and surrendering a bloop single Cuyahoga Falls managed to load the bases with two outs. But Abbott struck out the last batter and closed Massillon's second win of the day. Massillon raises its record to 8-3 while Cuyahoga Falls drops to 6-5. The Tigers have won their last six games. Caption: (1) Drew Feucht takes the big swing, (2) Jim Barkan gives 'em the heater, (3) easy in at second, (4) two runners in scoring position, (5) Anthony Battle beats the tag to steal second, and (6) between game snacks. 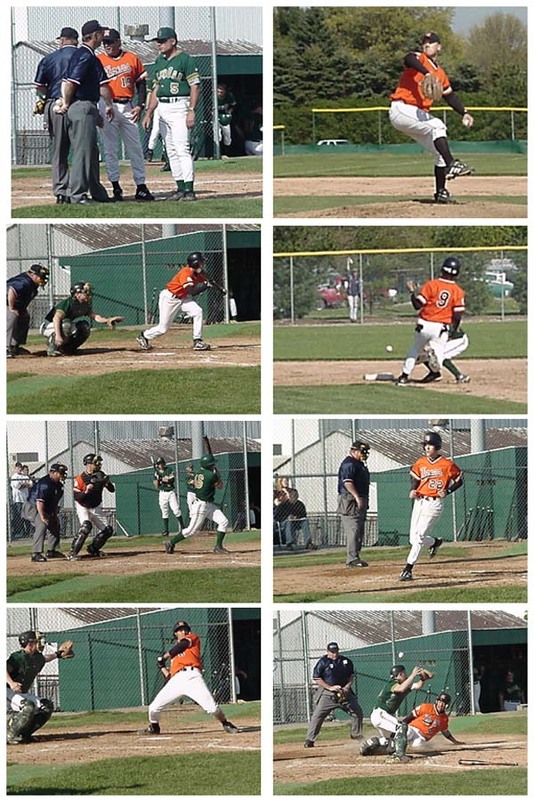 Caption: (1) Anthony Battle thinks twice about stretching a double into a triple, (2) Jason Savage fires to the plate, (3) Dan Ackerman leads off on first, (4), Todd Helline executes a perfect bunt, and (5) Ryan Ridgley sports his game face. The Massillon baseball team traveled to Marlington on Monday night and came away with their ninth victory in twelve starts. Starting pitcher B.J. Budd went the distance and recorded his fourth win of the season, this time via the shutout by the final score of 2-0. Budd limited the Duke batters to just two hits and a single walk, reminiscent of his pitching effort against Walsh Jesuit just a couple of weeks ago. In fact, he didn't allow a hit until the fifth inning. "He pitched a helluva game," said head coach Tim Ridgley. This one was a defensive effort, but the Tigers scored just enough runs to win. In the first inning Jason Savage earned a walk, stole second and then was batted in by Charles Hendricks. The run proved to be enough. For insurance, Massillon added a second run in the top of the seventh. Dan Ackerman reached first on a single and then stole second and third. Savage did the honors with a base hit. The Tigers improve their record to 9-3. The next game is on Wednesday when they travel to Lake, a team they defeated earlier this year 6-5. If there was ever a baseball team that felt like they were owned it has to be the Lake Blue Streaks. Lake was totally humiliated Wednesday night by Massillon 13-4. Couple that with a previous loss to the Tigers, 6-5. So the pre-season favorite to win the Federal League is now 12-2. Massillon scored early and often opening up a 10-3 lead after four and cruising home for the victory. "Everybody got a hit tonight," said Head Coach Tim Ridgley. "When you go to the park you never know what's going to happen." "Our kids did a really good job of taking the ball the other way, setting up many situations where we had runners at the corners. That puts a lot of pressure on the other team." Heavy hitters for the Tigers include Dan Ackerman (4 for 4, 1 RBI), Anthony Battle (3 for 4, 1 RBI), Drew Feucht (3 for 4, 1 RBI), Todd Helline (2 for 4, 1 RBI), Charles Hendricks (3 for 5, 2 RBI), Ryan Ridgley (2 for 4), and Jason Abbott (2 for 4, 3 RBI). The win goes to Jason Savage who allowed just three hits. Pitching in relief was Jason Abbott and the dependable Chris Swenson. Massillon's record is now an outstanding 10-3. Believe it or not, the Massillon baseball team entered today's contest with a 10-3 record and had not recorded a single home run. Well, that all changed tonight as power hitter Chad Marceric went yard against Norton in helping the Tigers win number 11, 8-7. After six innings, with the homestanding Tigers holding onto a 7-0 lead, this one was in the books. Or was it? Much to the chagrin of the fans, Norton found a way to tally seven runs to tie the game and another at-bat was need by Massillon. Fortunately, it was a short at-bat. Leadoff batter Charles Hendricks struck out on a 3-2 count and then Jason Savage crushed the ball to the right field wall for a stand-up triple. That placed the winning run in scoring position with only one out. At point, Norton had a choice to make. They could either intentionally walk the next two batters and pitch to the number nine batter, or they could pitch to Jason Abbott. They chose Abbott and brought both the infield and outfield in to set up a play to home or cut off a potential line drive hit. They never the chance to do either. Abbott went deep to right-center and that was the ball game. "We played flat today. I'm just thankful the guys came through with the hits in the seventh," said head coach Tim Ridgley. B.J. Budd started his sixth game of the season and held the Panthers hitless through four innings. Budd was retired at that point to save him for the tournament game coming up next Tuesday. Jim Barkan pitched the next two, surrendering just a single hit. Massillon used a consistent offense to score their first seven runs, banging out nine hits in the process. By the end of the fourth it was 4-0 and by the end of six the Tigers had increased their lead to 7-0. That's when Josh Strubel entered the game for mop-up duty. Strubel struggled right from the start and gave up 3 hits and 4 walks, retiring only two batters. Meanwhile, Norton was rounding the bases. With the score at 7-4 and the bases loaded, Strubel was replaced by Abbott. Abbott walked the next batter (he started with a 2-0 count) and then gave up a 2-run single to tie the game. But thankfully it ended there and the Tigers went on to post the win. Strubel had pitched only five innings coming into this game and had done well. Coach Ridgley felt it was an opportune time to get him some much-needed work. Unfortunately, Strubel proved very rusty. "We need to try to get some innings for these guys," said Ridgley. "We just haven't had the opportunity lately." Savage and Ryan Ridgley swung the hot bats today. Savage was 3 for 4 with a triple and scored two runs. Ridgley was 3 for 3 with a double. He also scored two runs. Massillon's record is now 11-3 and Norton falls to 5-10. Next up for the Tigers is Northwest who invades on Saturday for a doubleheader. Caption: (1) Jason Abbott rounds 3rd, (2) B.J. 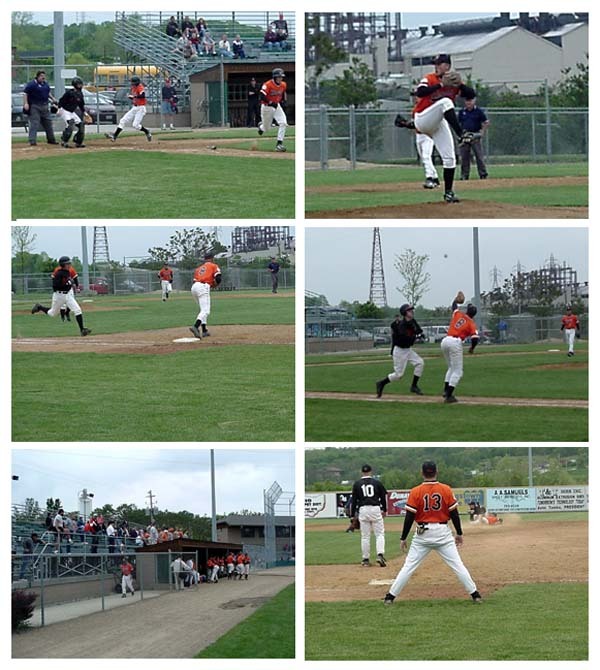 Budd on the mound, (3) Anthony Battle makes it to 3rd just ahead of the throw, (4) Todd Helline is safe at 2nd, (5) Jim Barkan fires to the plate, (6) Ryan Ridgley scores for the Tigers, (7) Helline heads for home, and (8) Charles Hendricks take a cut. The Massillon baseball team improved its record to 13-3 by taking both ends of a Saturday doubleheader against Northwest. The Tigers won the first one 3-2 and then cruised through the second 10-5. In that second game, Dan Melito rapped his first home run as a varsity player. David Broome started the game on the mound and went five innings, surrendering one run and scattering five hits. He left with the Tigers on top 2-1 having scored both in the bottom of the fourth. Broome "pitched a really good ball game" according to head coach Tim Ridgley. In that second inning, Anthony Battle smacked a leadoff single and then Jason Savage was hit by a pitch to put two on. Up came "Mr. Clutch", Jason Abbott, who smashed a double to right field to score Battle. Savage followed him in off a hit by Ryan Ridgley. None of the Massillon pitchers were left on the mound too long today in an effort to save them for next Tuesday's tournament game. So, in came Savage in relief of Broome. Savage struck out the first two batters of the sixth inning, but then gave up back-to-back hits allowing Northwest to tie the game. It took a little help in the seventh to finally ice this one. Northwest loaded the bases on three walks and then with one out Anthony Battle stroked a single to score B.J. Budd and finish the contest. This is the sixth time this season that Massillon has won the game in the seventh inning. Battle and Abbott each had two hits in the game. In the second game the Tigers jumped on the Indians early and opened up a 6-0 lead after two. Chris Swenson pitched the first four innings and proved to be in mid-season form. He held Northwest scoreless and hitless, giving up just one walk. He also struck out four. In relief of Swenson was Jason Weick making his initial appearance of the season. Jason had been hampered by mononucleosis and tendonitis in the shoulder and finally has these problems under control. "For the most part, I was happy with the way he pitched," said Ridgley. "This is a starting point for him. Now he has to move on." Weick had some control problems and gave up a few runs but managed to last 2-1/3 innings and get some much needed work. Jim Barkan came on to finish the game and the Tigers closed it out with a picture-perfect double play. The highlight of the second contest was a 2-run shot by Dan Melito that cleared the left field fence. It was a fastball right down the middle, according to Melito. "He's been swinging at bad pitches lately," said Ridgley. "But he sure pounded that one." Melito has been struggling at the plate of late and it didn't help that his grandfather passed away this week. But it was a sight to see this one get out of here. Finishing with two hits each were Todd Helline, Dan Ackerman, Chad Marceric, Charles Hendricks, and Abbott. "We put a lot of pressure on them offensively both batting and baserunning," said Ridgley. "That made it awfully tough on them in the first couple of innings." The Tigers are on a roll right now having won their last 11 games. But now it's time to get serious. Tuesday, they travel to GlenOak for a first-round sectional tournament game. "There's no question we're the better team," said Ridgley. "We've got to come ready to play. I think we will." The Tigers hope to erase the disasters of the last two years when they were eliminated in the first round by Jackson. If the Tigers come with their game faces on, look for a second-round matchup the following week. 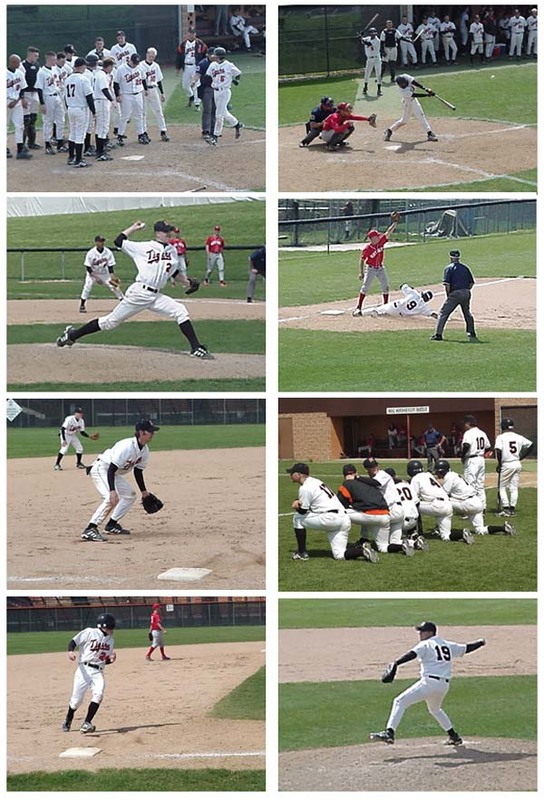 Caption: (1) Dan Melito rounds the bases with a homer, (2) Chad Marceric drives the ball, (3) Chris Swenson smokes 'em, (4) Marceric is safe at third, (5) Savage and Marceric, (6) watching the relief pitcher warm up, (7) Savage checks the throw, and (8) Jason Weick debuts. 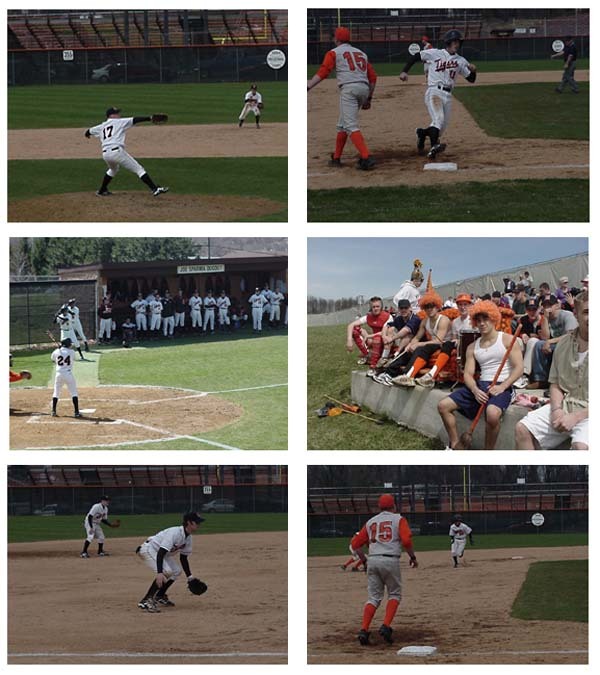 Massillon opened the sectional baseball tournament Tuesday with an exciting contest against the GlenOak Golden Eagles. They came away with a 4-2 road win on the pitching strength of B.J. Budd and the clutch hitting of the Tiger batters. Next up is North Canton Hoover. "We've got to come to the ballpark and play, and we did," said Head Coach Tim Ridgley. "The kids played well. I'm happy for the effort and happy for the program." After half a game of scoreless play the Tigers finally hit the board. Anthony Battle stroked a 2-out single followed by Charles Hendricks, who reached base on an error. Jason Savage then drilled the ball to center field to score Battle, just beating the throw home. Massillon tallied twice more in the following inning to take a 3-0 lead. Ryan Ridgley, Dan Melito, and Todd Helline loaded the bases on two hits and an error. With his second hit of the evening, Dan Ackerman singled to score Ridgley and then Chad Marceric sacrificed Melito in with a fly ball to right. They added an insurance run in the sixth when Jason Abbott knocked in Aaron Miller, who was pinch running for Jason Savage. Savage had reached base on a bunt hit and then stole second. Coach Ridgley beamed about both the bunt and Abbott's hit after the ball game. Meanwhile, B.J. Budd was pitching a masterpiece, throwing a good mix of fastballs, curves and change-ups. He even struck out the side in the fourth inning. But he made a mistake in the sixth that resulted in a solo home run. After that he appeared to tire. The next Eagle batter reached base on an error and he was brought around on a double to the wall. But with two outs and a man on, Budd threw a wicked curve ball to strike out the final batter. GlenOak mounted a serious threat in the seventh, loading the bases on two hits and walk. With only one out and Budd's control failing, the coach felt he was done for the game. Budd left after striking out ten and walking only one, scattering seven hits. "He pitched 120 pitches," said Ridgley. "He did a hell of a job. B.J. battled the whole game. They only hit a couple hard." Ridgley expressed his faith in Budd when he left him in to start the seventh inning. But he also knew when to take him out. "When is curve ball quits breaking, that's when he gets in trouble," said the coach. With the game was on the line, Jason Savage strode in from his shortstop position and prepared to face the heart of the GlenOak lineup. They say that big players play great in big games. Well, this one was no exception. Savage was not phased. All he did was strike out both batters and propel Massillon into the next round. "There's a kid who's been up and down all year," said Ridgley. "With the bases loaded and one out, he's got to come in and get them out. He came through with colors." Caption: (1) pre-game conference, (2) B.J. Budd on the mound, (3) Ryan Ridgley prepares to bunt, (4) Chad Marceric beats the throw to second, (5) Budd finishes off another strikeout, (6) Aaron Miller scores for the Tigerse, (7) a little chin music for Anthony Battle, (8) revenge is sweet. Caption: (1) B.J. Budd trots off the mound after fanning the side, (2) Jason Savage steals second, (3) Dan Ackerman can't beat the tag on the sacrifice try, (4) Savage with the bunt single, (5) game over, and (6) Handshakes. All good things must come to an end, and that's true for winning streaks also. The nemesis was Canton Central who ironically bookended Massillon's 12-game streak with a 7-4 victory coupled with an earlier 9-6 win. The Tigers didn't help matters by committing three errors. Head coach Tim Ridgley was very disappointed both in the outcome of the game and with the lack intensity by the Massillon players. "We came out flat. We weren't ready to play. Here we are on a 12-game winning streak and we didn't have enough tenacity to win the game. We got what we deserved." Central led 3-0 in the middle of the fourth inning before Massillon got on the board and tied it up. Scoring for the Tigers were Chad Marceric (two singles tonight), Drew Feucht, and Jason Abbott. But Central came right back to score in the next inning to take a one run lead. That's when Todd Helline decided to tie the game back up going long over the left field fence. It was his first round tripper of the season. With the score tied 5-5 going into the seventh, starting pitcher Jason Savage returned to the mound. But the arm just wasn't there anymore. Central scored three times and that was the game. "He said he felt fine," said Ridgley. But he hung a curve ball for 2-run double to put the game out of reach. Mental errors at crucial times contributed significantly to the loss. "Our outfielders did not play well," said Ridgley. "They missed too many cutoffs allowing the Central runners to get extra bases." The Tigers will attempt to regroup and prepare for the second round of the tournament when they host Copley on Saturday for a doubleheader. The first game starts at 11:00 am. 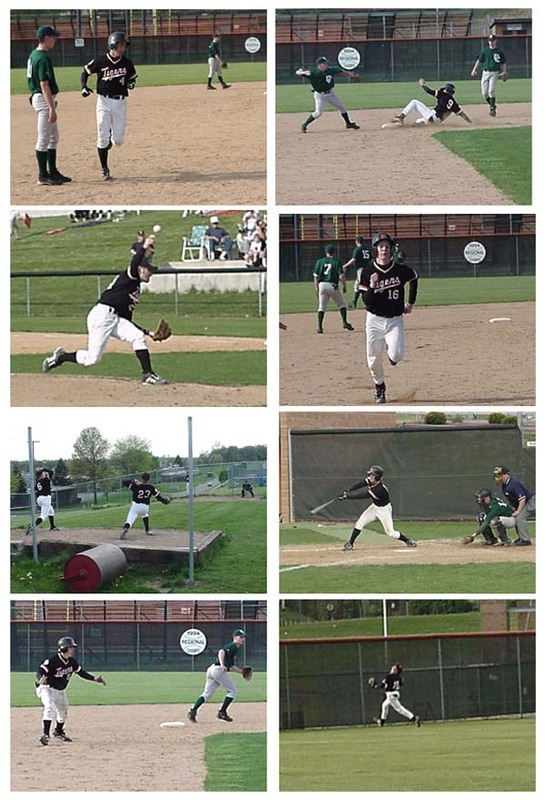 Caption: (1) Todd Helline on his home run trot, (2) Chad Marceric is safe at second, (3) pitcher Jason Savage, (4) Drew Feucht heads for third, (5) Jim Barkan and David Broome warmup, (6) Jason Abbott connects, (7) Dan Melito leads off after a double, and (8) Ryan Ridgley races the ball to the wall. Chad Marceric TUGERS TUNE FOR N.C. The Massillon baseball team continued its preparation for next Tuesday's tournament game with a doubleheader split with Copley. The Indians won the first game 5-4 and the Tigers won the second 3-2. Now Massillon will face Hoover for the right to advance to the district tournament. The Tigers fell behind in the first game 5-1 and almost pulled it out at the end. Although outhitting Copley 9-7, they committed four errors. Three of the miscues came in the first inning allowing Copley to tally two runs on just a single hit off starter B.J. Budd. Todd Helline led off the bottom half of the inning with a 3-base hit and then scored when the outfielder missed the cutoff. That was it for offense until the sixth inning. "We hit the ball but not when in scoring positions," said coach Tim Ridgley referring to the nine runners left on base. After three scoreless innings, Copley opened up on pitcher Chris Swenson by loading the bases. Then they executed a squeeze bunt to score the runner on third. Catcher Charles Hendricks retrieved the ball and threw to first for one out, but the return throw was just a bit late and a second runner made it home. A base hit tacked on the third run of the inning to make it 5-1, Copley. In the sixth, Charles Hendricks was hit by a pitch and then advanced on a hit by Chris Swenson. Both eventually scored on hits by Jason Abbott and Todd Helline. Then, in the bottom of the seventh, down 5-3, Andrew Marks knocked in Anthony Battle but was himself stranded when Abbott made the final out. Coach Ridgley felt the team played a little better in the second game. David Broome pitched the first five innings and gave up a pair of runs in the third. Massillon tied it in the fifth on hits by Dan Ackerman and Chad Marceric to score Ryan Ridgley and Budd. For the eighth time this season, the Tigers pulled it out in the final inning. Budd led off with a walk and then Charles Hendricks, running for Budd, made to second on a wild pitch. Todd Helline tried to bunt him to third but was called out after fouling off three attempts. Then Dan Ackerman was walked on four straight balls. That brought Marceric to the place with the winning run in scoring position. Chad needed only one pitch and lined the ball into left field to score Hendricks. That was Marceric's second hit of the game. Abbott pitched the final two innings and turned in an excellent performance, recording three strikeouts. Although wins are nice, coach Ridgley had different goals in mind today. The first was to get good looks at some other players. That he did in finding some playing time for Drew Feucht, Andrew Marks, and Matt Duplain. The second was to stay healthy. Mission accomplished. The third goal was to tune up for the tournament game. But you're supposed to try playing up to par when tuning up. "We played twelve innings flat today," said Ridgley. "We played two good innings of baseball. The mental preparation needs to pick up." But these Tigers are gamers and they will have their game faces on Tuesday. "I have no doubt they'll be ready, concluded Ridgley. "I have a lot of respect for these kids. When the marbles are on the table, they'll be ready." 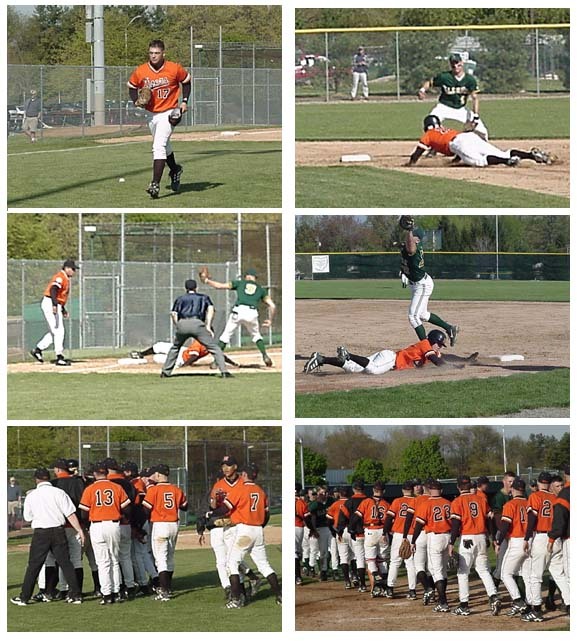 Caption: (1) Anthony Battle steals second, (2) Charles Hendricks scores the winning run, (3) Todd Helline prepares to bunt, (4) Jason Abbott is tagged out at home, (5) Jason Savage throws 'em out, and (6) pitcher B.J. Budd. A long ball started it and a long ball finished it as the Massillon downed top-seeded North Canton 3-2 in the sectional tournament baseball finals. It was a nail-biter right to the end with both teams having good opportunities to win. It also took eight innings to get it all in. As expected, B.J. Budd started on the mound and made it through six innings. He pitched superbly yielding no earned runs and striking out five. "I didn't think he had his best stuff," said Coach Tim Ridgley. "But when he goes out there he isn't going to quit. He fought and he fought and he fought." Anthony Battle cracked his first home run of the season in the second inning to put the first run on the board and that's the way it stayed until the sixth inning. With Hoover batting and a runner on first, Budd's pickoff attempt sailed over Battle's head. Since he had stepped off rubber when he made the throw, the runner was awarded third. The next batter grounded to third, but the throw was low and Hoover had runners at the corners. Both runs scored on a base hit, the only hit of the inning. The Tigers came right back in the bottom of the inning when Chad Marceric singled and Battle, who went 2 for 3 during the game, advanced him to second on a sacrifice bunt. That brought Jason Savage to the plate. His ground ball was mishandled by second baseman, allowing Marceric to score from second on the play. It was Hoover's only error of the game. In the top of the seventh Hoover loaded the bases, but the Tigers got out of it when Savage, pitching in relief of Budd, retired the last batter on a called third strike. In the bottom half of the inning Ryan Ridgley led off with his second single of the afternoon. Then Dan Melito and Todd Helline laid down perfect bunts to load the bases with no outs. It could have ended right there, but with a force play at home and two infield flies the game was headed to extra innings. In the top of the eighth Hoover's leadoff batter reached first base on a hit. Then he took off early when the next batter attempted to bunt. But the attempt failed and catcher Charles Hendricks gunned him out as he was trying to return to first. The rest of the inning was routine. That set the stage for the win. Following a flyout by Hendricks, Savage reached first on a walk. That's when Jason Abbott went deep over the left fielder's head. Savage, who thought the ball was going to be caught, stumbled as he tried to stop and return to first. But he regained his feet and raced home for the win. Coach Ridgley said after the game he was sending Savage home regardless of what happened on the base pads. "I was sitting on the fastball," said Abbott. "I knew it was going to carry when it went off the bat." And what a shot it was for it propelled the Tigers into the district tournament. "I told the players to just keep it close," said Ridgley. "It was the seventh game we won at the end. It was a helluva effort on our part. We battled and we battled. But it's better to be lucky than good. These kids have been together through a lot. They played over 400 games together in four years. They get along great." Coach Ridgley also praised the crowd for their support. Except for when someone borrowed the lucky lobster that guards the Hoover dugout. Now it's on to Struthers for the next round of the playoffs. Caption: (1) celebration time, (2) Jason Savage scores the winning run, (3) Anthony Battle drives the ball, (4), pitcher B.J. Budd, (5) the Village Idiots return, and (6) the team prepares to celebrate Anthony Battle's home run. 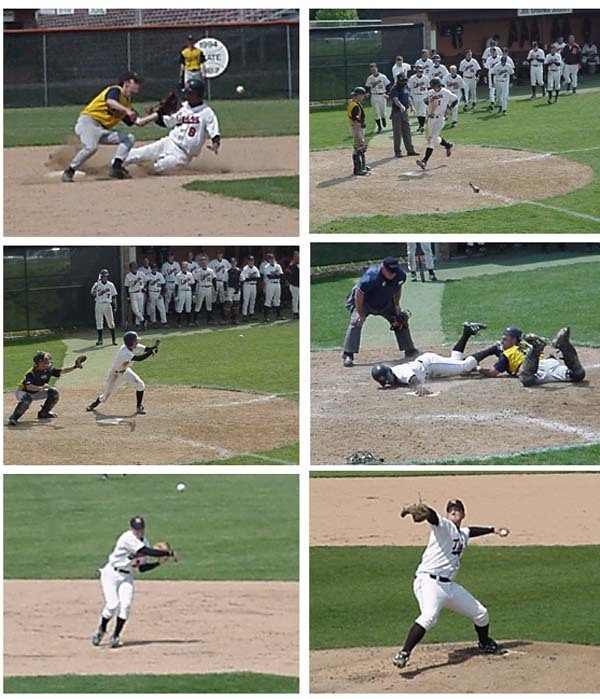 Caption: (1) Todd Helline bunts and beats it out, (2) Dan Ackerman steals second, (3) everyone clears out for Anthony Battle to make the catch, (4) Chad Marceric ties it up, (5) would the fake Jason Abbott please sit down, and (6) Ryan Ridgley on first. What's up with these guys? For the ninth time this season, the Massillon baseball team pulled the game out of the fire in the bottom of the last inning. This time it was a 4-3 regular season win over the Jackson Polar Bears, the second seeded team in the tournament. With the scored tied 3-3 going into the bottom of the seventh, Charles Hendricks became the latest hero by ripping the first pitch down the left field line to score Dan Ackerman. Ackerman had reached base on a walk and was sacrificed to second by Chad Marceric. Next, Jackson intentionally walked Anthony Battle, for they wanted no part of him. That's when Hendricks, who was 3 for 4 in the game, came up with the big hit. "I was happy with the way we played," said Coach Tim Ridgley. "But I thought we could have hit the ball more. The umpire was inconsistent making it difficult to hit. We got the big hits when we needed them. And Charles had a nice hit." Massillon jumped on Jackson in the first inning on three consecutive hits by Chad Marceric, Battle and Hendricks scoring two runs off of a blundered pickoff attempt and a fielding error. In the third inning they added another run when Hendricks hit the ball deep into the outfield to score Battle. It seemed at that point that the Tigers were firmly in control of the game. Through five innings, starting pitcher Jason Abbott had held the Polar Bears scoreless, giving up only two hits and striking out six. Even when Jackson scored in the sixth on a passed ball there didn't seem to be much concern. "I thought he threw real well," Ridgley said. "He pitched well for going six innings." The Tigers had a chance to ice the game in the sixth when the first four batters reached base. But two were thrown out and the fifth batter struck out to end the inning. Ridgley was banking on Ryan Ridgley hitting the ball and advancing B.J. Budd to second, but he missed and Budd was thrown out on the play. "It was a lousy pitch to hit," said Ridgley. "I'd like to have that sixth inning back. I blame myself." In the top of the seventh Abbott tired and put two runners in scoring position. All Jackson needed at that point was a base hit and the game was tied. They got it, off of relief pitcher Chris Swenson. That set up the drama in the bottom of the inning. Massillon now sports a 17-5 record. Meanwhile the coach is trying to let the kids have some fun. There are some big games coming up, but he emphasized that they are not as big as the one next week against Warren Howland in the district tournament. Note: The regular season game against Perry has been rescheduled for Saturday, May 20 at 1:30 pm. I was away last weekend and it sounds like I missed some pretty good baseball. Two of the state's better teams came calling and both of them left with defeats as the Massillon baseball team continues to prepare for the tournament tournament. 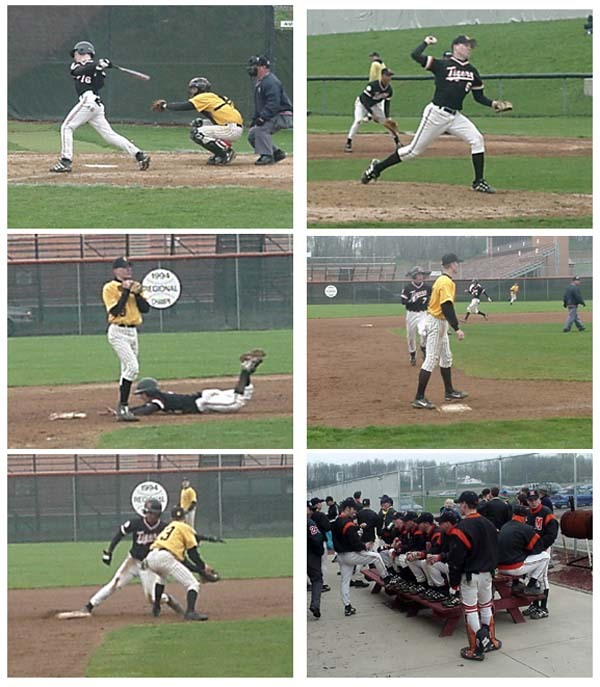 On Friday the Tigers defeated Akron Garfield 4-3, scoring the winning run in the bottom of the sixth inning. With Charles Hendricks on third, Coach Tim Ridgley called for the suicide squeeze. The batter, Ryan Ridgley, responded by laying down a well-executed bunt allowing Hendricks to score. Hendricks had reached base on a single and stole second. Then he was advanced to third on a bunt by Jason Savage. Both Hendricks and Savage batted 2 for 3. The win went to Chris Swenson, who came on in relief of starter David Broome in the sixth. Garfield, one of the best teams in the Akron area, falls to 17-5. On Saturday the Tigers played host to Mansfield Madison, the Associated Press' number 2 team. Madison entered the doubleheader with an outstanding record of 22-3 and are themselves preparing for district tournament action. Well, they got their wakeup call as Massillon blasted them in the first game 11-3. The Tigers compacted all of their runs into three consecutive innings, scoring seven in the fourth and two each the following innings. The big hitters for Massillon were Todd Helline (3 for 4), Chad Marceric (2 for 3) and Dan Ackerman (2 for 4). Marceric also batted in three runs. The winning pitcher was Jim Barkan who was given his first start of the season. Madison won the second game 7-1, scoring five in the first inning. But by then Massillon had made a statement that they can play with anyone in the state. Winning two out of three against top state competition gives the Tigers a lot of momentum heading into Tuesday's tournament game against Howland. Of course Massillon, with a record of 19-6, is also one of the top teams in the state. The Massillon baseball team has advanced to Wednesday's district championship game by blasting Warren Howland 7-0. The Tigers will now face their neighborhood nemisis, the Perry Panthers. Perry advanced by beating Boardman 5-4 in eight innings on the adjacent field. Starting pitcher B.J. Budd went the distance and recorded his seventh win of the season against no defeats. He had a no-hitter after five but gave up a couple hits down the stretch. "He had really good control of his pitches today," said assistance coach Jerry Vance. "His slider was very good." While fanning eight batters and walking only one, Budd needed only 84 pitches to get the job done. When asked about pitching with the big lead Budd responded, "It's easier to focus with a big lead. I just focus on the catcher and throw one pitch at a time." But this game wasn't just about Budd. It was a team effort all the way. The first seven batters scored the seven runs and all but one reached base. "I thought we played pretty well," said head coach Tim Ridgley. "I thought this was as good as we played this year. We played good defense. We got the hits when we needed them. And you've got to be able to bunt the ball in the tournament." It was the bunt that killed Howland. In the second inning Jason Savage and Jason Abbott both reached base on hits and then advanced to second and third. That's when Dan Melito executed a perfect squeeze bunt. Savage crossed the plate just after Melito laid the bunt down. The pitcher fielded the ball and threw the ball toward first, but the throw was late and Melito was safe with a hit. Meanwhile Coach Ridgley had waived Abbott home and he scored easily. The Tigers were up 2-0. The big damage was done in the third. Dan Ackerman led off by crushing a line drive into the outfield for a base hit. The next pitch hit Chad Marceric on the arm and there were two on. Then Anthony Battle walked and the bases were juiced. That brought Charles Hendricks to the plate. All it took was a shot to left field and two runs scored. An error on the second baseman and a sacrifice bunt by Ryan Ridgley drove in two more and the Tigers were up 6-0. "I really like to get up early," Ridgley said. "Kids are funny the way they think. It takes the pressure off of them and I feel more comfortable." They did it with base hits, hit and runs, squeeze plays, and stolen bases. "We've got the team speed to do this," he said. The final run was scored by Todd Helline after reaching first on a hit, stealing second, stealing third, and going home on the mishandled throw to third. Budd gave up a pair of hits in the sixth and had both on with one out. But he fanned the next one and Ridgley caught a deep fly to center at the base of the 410-foot wall. The only other hit Budd surrendered came in the seventh by the first batter. That's when Chad Marceric, Helline and Battle executed a picture-perfect double play. Budd struck out the final batter and strolled off the mound like it was just another day at the park. Caption: (1) Dan Melito's squeeze bunt scores Jason Savage, (2) it was B.J. 's day, (3) easy out at first by Anthony Battle, (4) Battle prepares to make the catch, (5) the Tiger faithful, and (6) Todd Helline is safe at second. The baseball district championship game between Massillon and Perry has been suspended until 6:00 pm on Thursday due to rain showers. The game was halted in the bottom of the third with the Tigers on top 3-1. At the end of the first inning Massillon was up 2-1 and had increased its lead to 3-1 in the third on a double by Chad Marceric. After Anthony Battle had reached base the game was halted. When play resumes Charles Hendricks will be at bat with runners on second and third and two outs. If Massillon can hang on to win this one they will play their next game on Friday May 16 at Thurmon Munson Stadium in the Canton Regional. The Associated Press released its state baseball rankings today and has Massillon, with a record of 20-6, in the 14th position. The only other Stark County team to be rated is Lake which the Tigers defeated twice this year. On Wednesday Lake lost in the Akron District to Akron Garfield, 3-2. Garfield fell to the Tigers 4-3 last Friday. In first place is Toledo Start, the team that beat Massillon in the 1994 state championship game. Start is the only undefeated Division 1 team in the state. Mansfield Madison hung onto the runnerup spot after splitting a doubleheader with the Tigers last weekend. Walsh Jesuit, a team Massillon downed 1-0 early in the season, is ranked 19th in Division 2. It took two days to finish it, but the Tigers are the District Champions after finishing off Perry 5-1. It's been a great 4-game run with the other wins coming against GlenOak, North Canton, and Warren Howland. Now it's off to the regionals and, thank heavens, closer to home. On Wednesday the game was suspended in the bottom of the third with Massillon up 3-1. Chad Marceric was on third and Anthony Battle was on second with two outs and Charles Hendricks at the plate. Then the rains came. The contest resumed on Thursday in the same configuration in which it was halted. The Tigers had a real opportunity to open it up with two runners in scoring position, but Hendricks struck out. In the fifth Dan Melito reached base on a walk and was sacrificed to second on a bunt by Todd Helline. That put Melito in reach of home for Dan Ackerman, who delivered with a double down the left field line. Massillon was now on top 4-1. The Tigers added an insurance run in the sixth when Hendricks and Jason Abbott reached base on singles. The honors then fell to Melito who singled in Chris Franks, who was pinch-running for Hendricks. With a 5-1 lead heading into the seventh, the game was well in hand. Jason Savage returned to the mound for his seventh inning of work (yes, he also pitched on Wednesday) and shut down the Panthers to pick up the win. The Tigers will now face one of the following four teams: Upper Arlington, Dublin Coffman, Lancaster, or Grove City. Grove City is ranked 15th in the A.P. poll. Massillon's regional semifinal game will be played at Thurmond Munson Stadium next Friday at 5:00 pm. Sorry folks, no pics on this one. In an abrupt finish to an otherwise spectacular season, Massillon was eliminated from tournament action by Dublin Coffman. The final score was 10-3 in a regional semifinal game. Dublin will now face Hudson in the Saturday finals while the Tigers conclude with a fine 21-8 record. Coffman scored five runs in the top of the first and that was pretty much the ball game. The inning was in sharp contrast to the success B.J. Budd had this year as a starting pitcher, yielding four singles and walking two in the inning. "B.J. wasn't throwing well," said Coach Tim Ridgley. "He kept the ball up. And he couldn't get his curve ball over. When he doesn't do that, he's in trouble." Pitching while sick didn't help either. Budd seemed to find himself in the third when he struck out the first two and forced the third into a flyout. But in the fourth inning he surrendered a 3-base hit to right field and two more runs came in. In four innings of work, Budd gave up six runs, nine hits and three walks. Jason Savage came on in the fifth and completed the game giving up a pair of runs, two hits, and three walks. He also struck out five in a very commendable effort. But you can't take anything away from Dublin. They stroked the ball all over the field and didn't waste many hittable pitches. They also received good work from their pitching staff. The Tigers matched Dublin in hits, but just couldn't come up with the big inning. In all they left nine runners on base. Seven of the nine starters had at least one base hit and four had at least two including Charles Hendricks (3 for 4), Ryan Ridgley (2 for 3), Todd Helline (2 for 3), and Chad Marceric (2 for 4). "We didn't play well," Ridgley said. "They played better. That first inning just killed us. It took us out of our game plan. Dublin has a great hitting ball club." With the bases loaded and one out, Massillon had a chance to get out of the first inning with just minor damage. The Dublin batter hit the highest bloop single this writer has ever seen and ended up on first when the Tiger left fielder broke late and couldn't chase it down. That brought in the first run. Budd walked the next one in and then gave up back-to-back singles. The first one should have been the third out but was just played poorly in right field. Dublin added one in the second to increase their lead to 6-0 before the Tigers finally scored in the third. Helline walked and then advanced to second on a botched pickoff attempt. Chad Marceric followed and hit a shot to left field to score Marceric. Massillon scored their only other runs in the seventh when Helline, Dan Ackerman and Marceric all reached base on singles. In combination with Anthony Battle's sacrifice fly, the Tigers plated two runs. But they had a long way to go to make up a 10-3 deficit and the final two batters failed to reach base. So the season ends and we say goodbye to many fine seniors including Charles Hendricks, Todd Helline, Dan Ackerman, Anthony Battle, Chad Marceric, Jon Stanke, Aaron Miller, Chris Swenson, Jim Barkan, Jason Weick, and David Broome. All of these players will be sorely missed. But rest assured that there a number of very good ballplayers coming in next year to fill their shoes. Coach Ridgley concluded by saying that, "if you learn one thing from this senior class, it is never give up." These Tigers never believed they were out of any game until the final out was made. 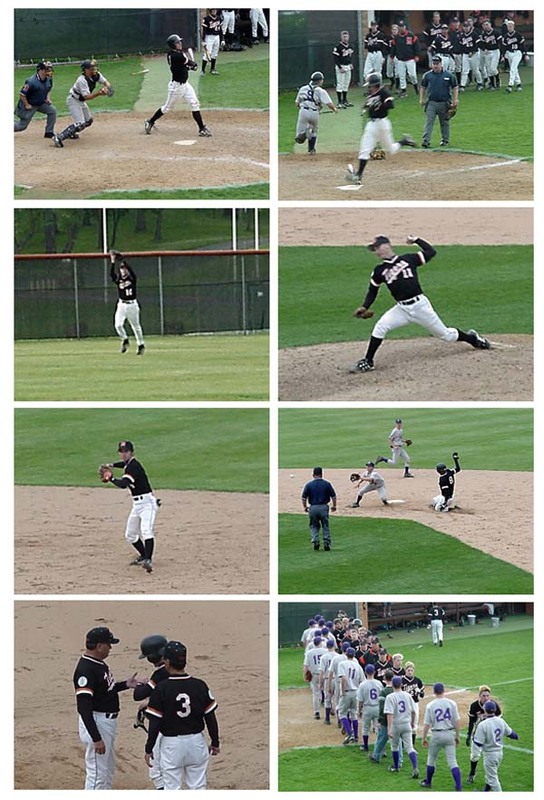 Publisher's note: It has been extremely enjoyable covering the Massillon baseball team this year. This team is comprised of many fine gentlemen and some outstanding coaches. It was very much a pleasure to get to know some of them and see the players in action up close and personal. Also, thanks to Coach Ridgley for providing this close access and any other support I need. He and I are both in agreement that this game is for the kids and should be left as such. Caption: (1) and (2) Todd Helline rounds second and heads for home, (3) starting pitcher B.J. Budd, (4) Ryan Ridgley with another hit, (5) Dan Melito with the catch, (6) pregame huddle, (7) Dan Ackerman scores, (8) Helline dives back to first, (9) Village Idiots, and (10) the dugout. 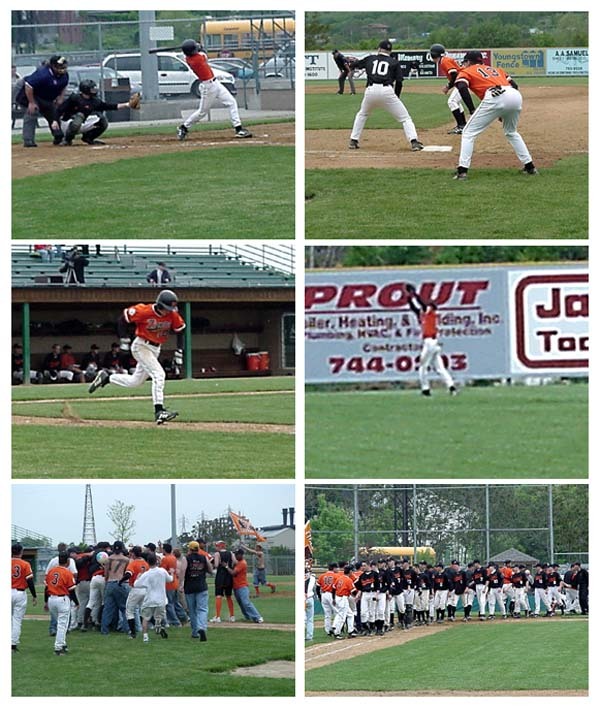 Caption: (1) Jason Savage delivers to the plate, (2) the coaching staff, (3) Todd Helline scores the first run, (4) Dan Melito swings for the fence, (5) the Tiger contingent, (6) Anthony Battle swings at a low one, (7) post-game talk, and (8) student support.